With the hot summer months officially here, it’s the perfect time for pet owners to give their dogs a little extra TLC with proper grooming. With just a few easy tips and a little bit of elbow grease, anyone can help keep their pet looking great and feeling cooler this summer. WOULD YOU RATHER HAVE US PAMPER YOUR PET? MAKE A SPAW APPOINTMENT TODAY. If your pup loves to cool off in the summer with a bit of swimming in local ponds, lakes or rivers, you’ll need to pay extra attention to their ears. Bacteria can be found in natural water sources and make a home for themselves in the warm folds of your dog’s ear. Buy a quality ear cleaner and be sure to follow the directions on the bottle, after a day out on the water with your dog. You should always do your best to keep the hair between the pads of your dog’s feet short, no matter their age or the time of year. Short pad hair means less mess tracked into your home and it also gives your pup better traction to prevent slips and falls. 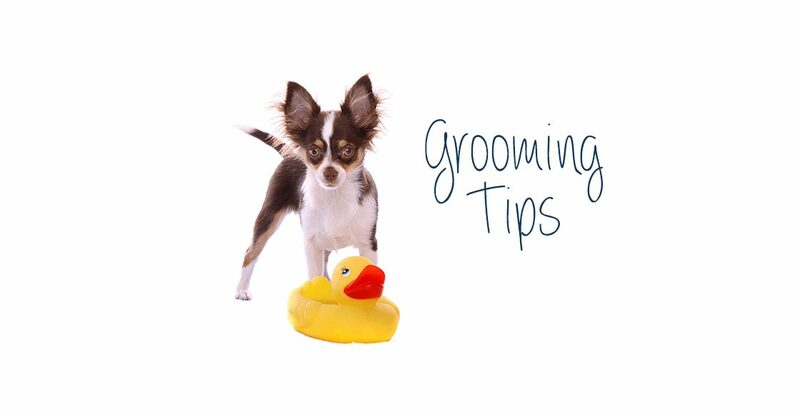 As the temperatures start to rise, you may think it’s a good idea to give your pup a quick shave to help them stay cool. While this is okay for some breeds, double-coated breeds like Retrievers and Pomeranians need to keep their thick coat even in the summer. This is because the double-coat actually allows your dog to regulate their body temperature and keep their skin protected too. Instead of a trim, try brushing their coat out with a de-shedding tool. Brushing your dog regularly is the best way to keep their skin and coat healthy. Avoid painful knots, tangles and more serious skin issues by taking the time each day to brush, de-shed, comb or rake their coat. While it can take some patience to get your dog to settle down for a good brushing, the earlier you can implement this good habit the better. Over time, you and your dog will both come to enjoy this bonding time together.